At the back door to the San Luis Valley sit the little town of La Veta, a stone’s throw west of Walsenberg but not on the established route to Alamosa or the Great Sand Dunes National Park. Unless you are a restless wanderer or a kayaker scouting for possible runs on the upper reaches of the Purgatoire River, you probably wouldn’t have any reason to pass through La Veta. And yet there is a gorgeous pass waiting to be climbed.The 2013 version of the Stonewall Century is August 10. You’ll have a chance to climb Cuchara Pass twice. 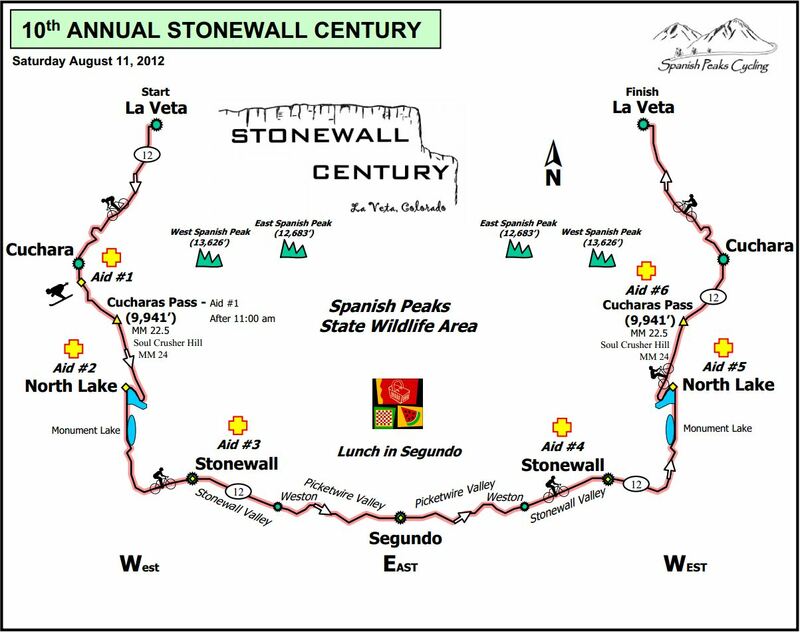 The Stonewall Century is that rarity among Colorado rides: an out and back. It starts in La Veta, climbs up past the old Cuchara Valley Ski Area (now trying to reinvent itself as a four season destination resort!) tops out on the Pass at just under 10,000 feet, and drops down to the small hamlet of Segundo for lunch and the turnaround. Cuchara Pass is rated as a 2.9 and a 1.3 (north and south) in the database of climbs that the Rocky Mountain Cycling Club maintains, which puts the pass (or at least the north side of it) somewhere near the low middle of Colorado passes in difficulty, harder than Vail, Berthoud, and Lookout Mountain, but not as hard as Deer Creek/High Grade, Super Flagstaff, or Squaw/Juniper. But don’t be fooled. There are 7,500 feet of climbing. The climbs on each side average about 3.5%, but that’s deceptive since the measuring starts at La Veta and Trinidad respectively. And with a stretch near the top called Soul Crusher Hill, you’ve got to expect that the climbs will get steeper before you reach the top. But that’s why we do this kind of thing, isn’t it? This map and the profile below are both done by George Rooney, whose cartography work with Team Evergreen I’ve long admired.